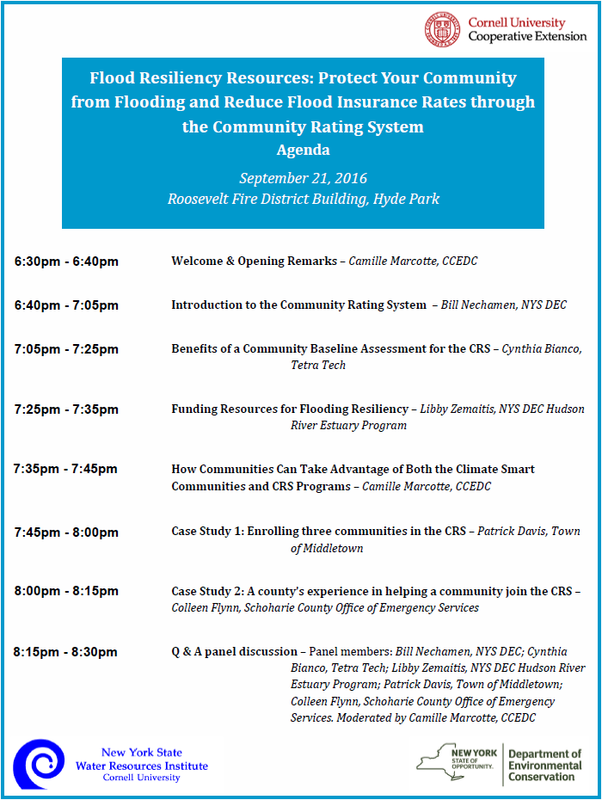 On Wednesday, September 21st, 2016 Cornell Cooperative Extension hosted a workshop on Flood Resiliency Resources: Protect Your Community from Flooding and Reduce Flood Insurance Rates through the Community Rating System. The workshop provided an overview of the program, including its benefits and how to determine if the program is a good fit for your community, how to enroll in the program, and discussion of flood adaptation and mitigation actions communities can undertake to improve their flood resiliency. 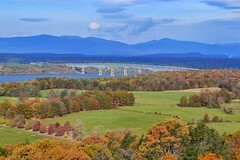 The forum also highlighted the New York State Climate Smart Communities (CSC) Certification program and how actions communities take to become certified within the CSC program overlap with activities communities receive credit for under the Community Rating System, thus allowing communities to benefit from both programs. Presentations also included case studies from communities that are participating in the CRS, Middletown/Fleishmanns/Margaretville and Esperance (Schoharie County), as part of their strategy to improve floodplain management and save residents money on flood insurance. Communities are saving tens to hundreds of thousands of dollars annually and reducing their flood risk by participating in the Community Rating System, a program within the FEMA National Flood Insurance Program (NFIP). The CRS rewards communities that go beyond the minimum requirements of the NFIP, providing a discount on flood insurance premiums for a community based on its CRS class. The Community Rating System encourages communities to undertake actions which will reduce their vulnerability to flooding to receive points in the program. Actions taken can improve a community’s ability to prevent and recover from flood loss, and to afford flood insurance. Over 170 New York municipalities have made the decision to engage their citizens in energy efficiency, renewable energy and the green economy through the ten program elements in the Climate Smart Communities Pledge. The CSC Certification program provides a framework to guide communities’ climate actions while also providing recognition for their leadership. There are over 120 individual actions communities can take to mitigate and adapt to the effects of climate change while simultaneously earning points in the program.